DESCRIPTION Situated along Lower Street in Pulborough is this 2/3 bedroom semi-detached COTTAGE. 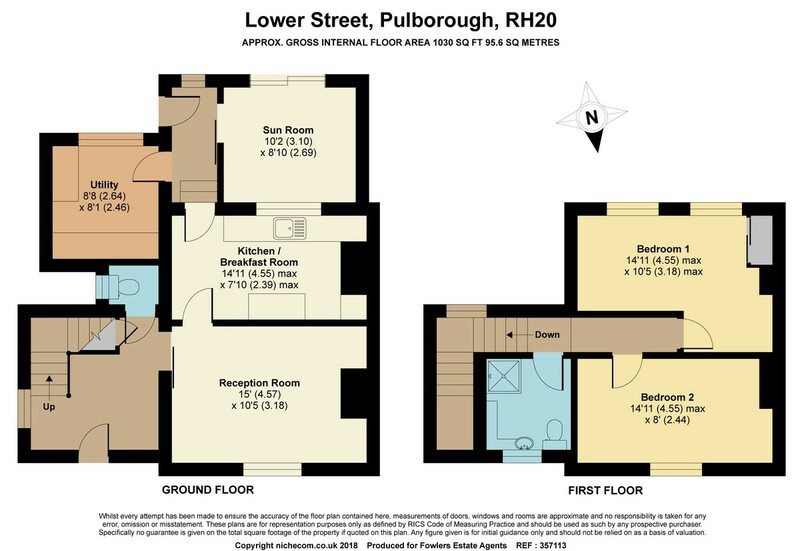 The property has a sitting room, dining room/sun room, ground floor cloakroom. A half landing leads up to the first floor with the two bedrooms ( Formerly 3 beds ) and family shower room. The real feature of the property is the SOUTHERLY FACING REAR GARDEN with views towards the South Downs. The property is offered for sale with NO ONWARD CHAIN. ENTRANCE HALL Radiator, understairs storage cupboard, uPVC double glazed window. GROUND FLOOR CLOAKROOM Low level flush w.c. SITTING ROOM 15' 0" x 10' 5" (4.57m x 3.18m) Feature fitted coal effect gas fire with stone plinth, radiator, uPVC double glazed window. INNER LOBBY Stable door to rear garden. DINING ROOM/SUN ROOM 10' 2" x 8' 10" (3.1m x 2.69m) Sliding double glazed windows leading to rear garden, radiator. UTILITY ROOM 8' 8" x 8' 1" (2.64m x 2.46m) Range of working surfaces with sliding storage cupboards under, uPVC double glazed window, space and plumbing for washing machine. FIRST FLOOR HALF LANDING uPVC double glazed window. BEDROOM ONE 14' 11" x 10' 5" (4.55m x 3.18m) Radiator, uPVC double glazed windows, TV point. FAMILY SHOWER ROOM Fully enclosed shower cubicle with fitted independent shower unit, low level flush w.c., pedestal wash hand basin, uPVC double glazed windows, wall-mounted electric heater. FRONT GARDEN Mainly paved with gravelled area, side access. REAR GARDEN Being a feature of the property, mainly laid to lawn and screened by hedging, timber summerhouse, large paved terraced area with pergola and grape vine, steps down to further lawned area with mature trees and shrubs.